Written by: Karen on July 6, 2016. When it was made and broadcast by the ITV regional company ATV, Timeslip was groundbreaking children’s drama. Remembered by everyone who saw it as a benchmark of 1970s telefantasy in the UK, the complete series has now been released on DVD by Network Distributing Ltd as part of a limited edition set featuring exclusive packaging, all 26 episodes and a brand new ‘making of’ book by TV historian Andrew Pixley. Devised by Ruth Boswell – who would go on to produce both The Tomorrow People and Shadows – Timeslip blends hard science and fantasy in its tale of two teenagers who discover the existence of a ‘time barrier’ enabling them to travel to different periods and locations – from World War Two to chilling visions of the distant future (1990!). The programme even had its own ‘scientific advisor’, in the form of Geoffrey Hoyle (son of the astronomer Sir Fred Hoyle, with whom he wrote a number of science-fiction novels). 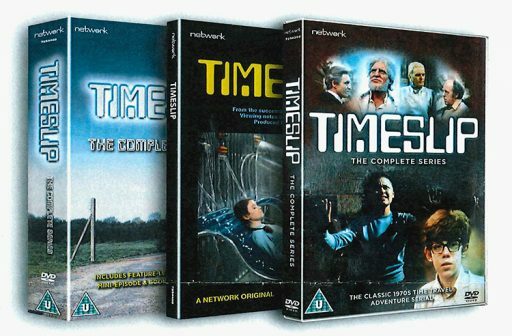 The limited-edition set contains all four (linked) stories, which were spread over 26 episodes, starting with The Wrong End of Time (originally conceived as a stand-alone six-episode adventure), and continuing with Time of the Ice Box, The Year of the Burn up and finishing with The Day of the Clone. They are presented in their original, as-transmitted, full screen aspect ratios – though sadly only one episode still exists in colour. The picture quality and vibrant colours on this solitary survivor makes the loss of the rest of the colour prints all the more heart-breaking – but fortunately the stories are still intriguing enough to thrive even in monochrome. Writers Bruce Stewart and Victor Pemberton developed Boswell’s initial outline to include concepts and ideas which still resonate – even if the costumes don’t! Special effects are minimal and largely unnecessary, and although the studio-bound sets can occasionally look a little unconvincing, the tension and intrigue is enough to pull the viewer along. The acting from the leads – including teenagers Spencer Banks (Simon) and Cheryl Burfield (Liz) – is excellent, with the ever-reliable Denis Quilley putting in some sterling work as the mysterious Commander Traynor.